We’d love your help. Let us know what’s wrong with this preview of Walking Through the Jungle Big Book by Julie Lacome. To ask other readers questions about Walking Through the Jungle Big Book, please sign up. This is a nice, simple story which I would read to a EYFS class when covering a topic such as the jungle. The illustrations are bright and colourful making it a great book to read aloud. The text rhymes and young children will soon learn to chant along with you as you read. There are also plenty of actions in the book such as swinging in the trees with the monkeys and wading through the swamp with the crocodiles, which would be fun to do with a young class. This is a good basic resource and it s This is a nice, simple story which I would read to a EYFS class when covering a topic such as the jungle. The illustrations are bright and colourful making it a great book to read aloud. The text rhymes and young children will soon learn to chant along with you as you read. There are also plenty of actions in the book such as swinging in the trees with the monkeys and wading through the swamp with the crocodiles, which would be fun to do with a young class. I used this book as part of a week long scheme of work for English. The book has some really effective rhyming paragraphs which follow a regular pattern throughout, allow for effective reinforcement of the notion of rhyme. The regular layout of the paragraphs also allows for discussion/reinforcement of word classes. I found the illustrations to be charming but average, which is what I would say about the book as a whole- I think the children enjoyed it a lot more than I did! I thought it was a li I used this book as part of a week long scheme of work for English. The book has some really effective rhyming paragraphs which follow a regular pattern throughout, allow for effective reinforcement of the notion of rhyme. The regular layout of the paragraphs also allows for discussion/reinforcement of word classes. I found the illustrations to be charming but average, which is what I would say about the book as a whole- I think the children enjoyed it a lot more than I did! My son thoroughly enjoys this book, and guessing the animal that shall be coming on the next page. This could be fantastic for Pie Corbett style dramatic actions to tell the story while bringing it to life. Would also be good for inclusion of EAL students. This story is about a boy who encounters many different animals when he walks through a jungle and wonders if they are following him. This book won the “American Bookseller Pick of the Lists” and “Parenting Best Book of the Year” awards. I would recommend this Big Book to be used in kindergarten because it has amazingly well-created large pictures that captivate any reader along with a small amount of text. Students may be interested in this book because of the many different animals represented This story is about a boy who encounters many different animals when he walks through a jungle and wonders if they are following him. This book won the “American Bookseller Pick of the Lists” and “Parenting Best Book of the Year” awards. Fun storytime book. The kids loved making the animals noises and guessing which animal was coming up next. I love to use this big book with the toddlers - they have so much fun guessing which animal comes next and making all the animal sounds! 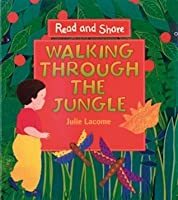 ‘Walking through the Jungle’ takes the form of a poem about a little boy who walks through the jungle and describes the sounds he hears and the animals he sees. This is a great book for children to grasp the vocabulary of how animals move in the jungle and their home environment. This book allows children to engage within the story as they anticipate the arrival of a new animal on each page. The poetic structure of this book appeals to younger children because of its repetitiveness. 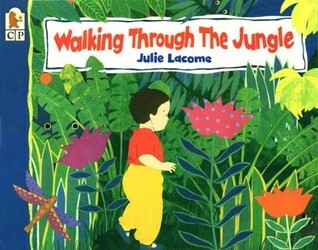 The book has ‘Walking through the Jungle’ takes the form of a poem about a little boy who walks through the jungle and describes the sounds he hears and the animals he sees. This is a great book for children to grasp the vocabulary of how animals move in the jungle and their home environment. This book allows children to engage within the story as they anticipate the arrival of a new animal on each page. The poetic structure of this book appeals to younger children because of its repetitiveness. The book has loads of potential to encourage children to be active by moving around and pretending to be jungle animals. The illustrations fill the entire pages allowing readers to fully engage as though they’re in the jungle themselves. A great read for all ages and definitely one for the bookshelf. Well the first thing the kids loved about this is that it's a big book! The book is almost bigger than some of they are! In addition, it has animal noises. It was pretty fun to make the different noises and look at the animals. The language is super easy and there's repetition so they can follow along really well. After we read it, the kids wanted to look at it themselves all the time. 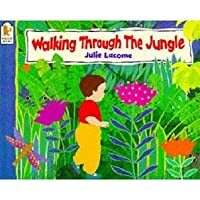 a toddler book for sure about a boy walking through the jungle and hearing different sounds which are then associated with an animal. Each sound has a movement attached that could be repeated with the kids. In this traditional English nursery rhyme, a young boy imagines various animals following him through the jungle. It's cute, the rhythm of it "works" the babies really, really love this book maybe because it connects a small person with the jungle scenes. I like that there are different physical ways of moving in the story. Every single pronoun is male. Yep. One of those. actions, easy to get kids to interact and guess what the animals are. I read this at storytime today and the caregivers really seemed to like it, but I thought it was a little weird. Little kids love guessing what animal makes the noise in the book. Also you can add actions for each page. A fun read. It works well in groups, as a sing along rhmyme which children can join in.